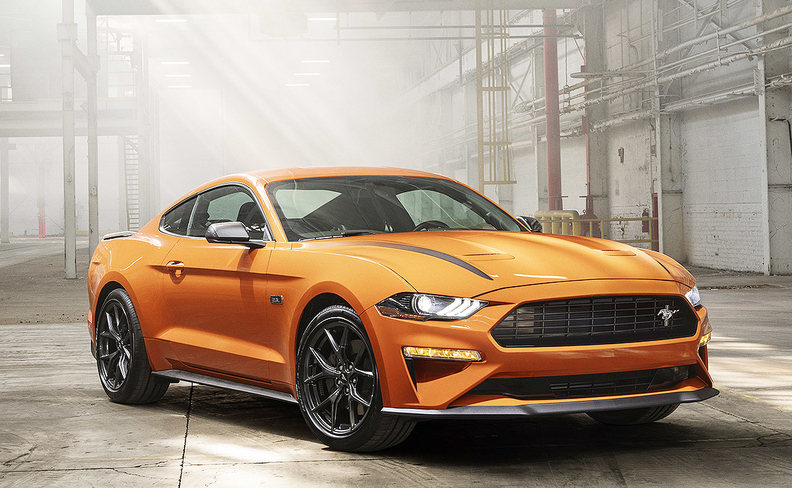 DETROIT — Ford Motor Co. aims to help compensate for the loss of the Focus RS by introducing a High Performance package for the EcoBoost 2020 Mustang. Ford says the idea for the package came from engineers experimenting with a Focus RS engine swap, and its development was fast-tracked over the course of 10 months. It revealed the package as part of a weeklong celebration of the Mustang's 55th anniversary. "When our team got the chance to try this specially built engine in a Mustang, we immediately agreed, 'We have to do this,' " Carl Widmann, chief engineer of the Mustang, said in a statement. "It's not just the horsepower gains over the standard 2.3-liter EcoBoost, it's the broader torque curve that delivers 90 percent of peak torque between 2,500 and 5,300 rpm, which is 40 percent wider than the base EcoBoost engine." Widmann said the new package also enables "more usable power and torque for enthusiasts and weekend autocrossers to enjoy." Ford says the 2.3-liter High Performance package will give the Mustang a mid-4-second 0-to-60 mph time and a top speed of 155 mph, 34 mph faster than the base EcoBoost Mustang. It adds semi-metallic brakes, specially calibrated MagneRide dampers and other performance parts. The package will be available on the fastback coupe and convertible models configured with either the six-speed manual or 10-speed automatic transmission. It can be ordered in one of four new Mustang colors for 2020: Grabber Lime, Iconic Silver, Red Hot Metallic Tinted Clearcoat and Twister Orange. The High Performance package, available in fall, will replace Ford's Performance Pack 1 on the entry-level EcoBoost Mustang, but Performance Pack 1 will remain available on the GT variant. Ford did not disclose pricing.